I have found that tying a project to the maker's experience is the best motivation in a classroom. Though I am using "altered books" as the focus of this post, this could easily be applied to a painting project, drawing series, clay exploration, or even a photography assignment. Most everything I post on my blog can be applied to more than just one medium. I love building scaffolds for my students to build with. This exploration begins with a little self-examination. We look at 5 life events that make us who we are today. Here is the form I used. It is included in my book, "The Art Student's Workbook" from Firehouse Publications. They choose their own 5 events, but I have provided a list of some common experiences to get them started. I encourage them to go beyond this starting point. It is always best if the teacher models this before students begin so they have an idea of the possible tone. I told them about 3. I spoke about how when I was in 4th, 5th, and 6th grade I had a very influential art teacher who helped me see that I did have a talent and he encouraged it. This was pivotal in me connecting to art education. When I was in college, I had a chance to do a student exchange to Japan for a year. I learned to be independent, learned to thrive in new situations daily, found my own inner strength, and a passion for Asian art that is with me today. The passing of my father was also pivotal. I had to make the decision to withdraw life-support when we knew it would not help in the long run. I put his ashes at the foot of a mountain where he wanted to rest, and I was his executor, doing all he wanted after he was gone. Though this was a very sad chapter in my life, I was honored he trusted me above all others, and I cherish all the lives of those around me even more. I explained that both positive things and negative experiences shape who we are. I also explained that I understand not everyone is ready to explore tough issues. Students were free to dig as deep or topically as they felt comfortable with. They were also welcome to include tough experiences, but did not have to explain them in detail while we graded. Saying "This part represents a difficult time," would be perfectly acceptable. Some did go deep, with dark symbols for abuse issues, and others stayed in their comfort zone with topics of likes and achievements like a driver's license. Obviously if something alarming comes up, seek the help of guidance counselors. Below is a Youtube compilation of a few projects. ​I want to reiterate that this art exploration could be done as a painting or any media. Below are samples of sunset silhouettes completed with symbols as well. Image from The Smith College Museum of Art. Click image to visit their site. ​As teachers, we know how to visit an art museum, but for many of our students, it may be a new experience. We should not be surprised if they want to walk up and touch the creamy textures of a Wayne Thiebaud cake painting. But if they have never been told, "That's a no-no," they might not honestly know. ​Prepping a class for a visit is as important as the actual visit. Students need an assignment to keep them busy, looking, exploring, and focused. Showing them a few images before the trip can set a tone. For younger kids, setting up a mock museum visit with posters on the classroom wall can be both fun and informative. Have students model both good and bad behavior. It will be fun and educational! I give my students this paper below. One side is the 10 Commandments of a Museum Visit, and the other side is their graded assignment. I also try to show students the proper way to take a photo if the museum allows that (and without flash) and how not to back up into a work of art while taking a selfie. ​Maybe you want to forbid the use of electronics, and that's fine, but teaching appropriate use of them can be helpful in the long run. I have students set a timer on their phone to return to a pre-set pick-up-point. Knowing what work is in the museum can allow you to make a scavenger hunt for students. They can find the work, and add the proper labels to prove they located it like the date, artist, and medium. Below is the form I use with my students, and it requires that they sketch a few works and think about their selections. Obviously you'll need to take the age of your students into account for the kind of assignment you'd give them, but this has worked for me for grades 4 and up. I do not take work home with me 99.9% of the time. It is important for my sanity to leave work at work. The "HOW" is what I hope to share with you in this post. I often arrive early to prep my room and lessons. I use my "free time" to work, sometimes even through lunch. When things are quiet, I am planning for the next day/week. I have begun to video tutorials to make presentations easier and more consistent. The only negative is that I spend VERY little time socializing with colleagues in school. I meet with other members of my department, but, in general, it is about the business of teaching and coordinating lessons or resources. I socialize more on Professional Development days, because they often have little to do with art and we're not allowed in our rooms. However, the biggest difference is the way I handle transitions between projects. This method may not be helpful to those who teach art to a class once a week, but more helpful to those who see students daily for a quarter, semester, or year. I end each project with a written assignment, sometimes a quiz, and a written critique. This gives students some independent time where I can meet them one at a time to grade, give feedback, and enter grades DURING class. I begin each project with detailed notes, written motivations, and information/vocab for the next project. Again, most I do not need to be up front and presenting. This helps me finish grading, and getting materials together for the following project. Planning and sketching helps focus student ideas, understand the direction they want to explore, and become familiar with the terms that we will be using. If I feel they are less than focused, I give them a pre-quiz to keep them on their toes. When I am ready, we review their notes, make corrections as a group or in pairs, and I show them concrete samples of the project we will begin. Some might say that it is unnecessary paperwork, and I should be using that time for more hands-on work. But I have found significant benefits. 1. They need more writing exercises in school to improve those skills. 2. Planning means they are more focused and waste fewer supplies. 3. I am less stressed and overworked. When the day is done, I am done. 4. I know the writing improves their SAT scores (along with my STEAM approach) because they outscore their peers by an average of 150 points! Here are some examples of my pre-planning pages and critiques. Many more can be found on my published resources HERE. I have taken all the worksheets that I have designed in my near 30 years of teaching and put them into my workbooks. In the video below, you can see some of the worksheets I use. These are what students complete before and after a project allowing me time to grade, assess, and enter scores into grading programs. 99.9% of the time, I take nothing home. ​If you think STEAM/STEM is a fairly recent and annoying fad... You need to realize it's been around since da Vinci. We all know he painted, sculpted, designed buildings, flying machines, and studied the workings of the human body as recorded in his notebooks. Art was the hub of his wheel that had spokes of science, math, geometry, biology, engineering, and more. STEAM/STEM was a term coined in the mid-1990s and seems to have grabbed a foothold in this new century, but many art teachers have been steam experts long before that, because it's just the natural way an art program can be taught. ​I'd argue that we actually go further in art buy including reading, writing, history, and problem solving skills. This is why art students outscore their non-art involved peers on exams like the SAT by an average of 100 points. You do not need to attend many hours of professional development to incorporate STEAM. In all likelihood, you may already be doing it, or need to make a tiny adjustment to do so. I titled this post "KISS" for the acronym "Keep It Simple Silly." Including some STEAM IS as easy as breathing. It may require adding a few tools in your classroom, but many can be collected over the years, or bought at the dollar store. 1. Use a ruler when you can. Making grids, measuring frames, creating tessellations, measure when it makes sense to do so. Students learn about rulers in other classes, but it is in art that they can USE a ruler in a meaningful way. 2. When you talk about color, take out a prism, and show how light is broken into its component parts. It's magical, and it's science! Some of you may have color paddles to show how overlaps another to make new colors. Have these handy for color discussions. 3. Weigh stuff. Have a scale in your classroom. Instead of asking students to get a ball of clay, ask them to get 8 ounces, or whatever is appropriate. Fill a cup with one ounce of red paint. Weighing is a good skill that connects with science and math. I get my scales at the dollar store. 4. Plan with labeled sketches. When students plan, sketch, and draw before making a final work of art, they are learning important engineering skills. It also helps avoid waste and idol time. Students are more focused when they have a plan to follow. 5. Build and construct from time to time. Building, balancing, attaching, and creating structures/sculptures are important skills for sculpture and engineering. Not only that, it's fun! Personally, I include 2 additional areas/subjects in my teaching, it is quite likely you do too. History/Cultures and a writing component. For reading and writing, students can do a written critique in the middle of their projects, or at the end, analyzing their work, and summarizing what they learned, and how they might improve their project. Once in a while, I do ask them to repeat a project of their choice and incorporate these improvements. I don't check for spelling or grammar, but the act of reading, writing, analyzing is an important skill that crosses all content areas. As for history and cultures, that seems more obvious. Everything we do in the classroom can be tied to an artist, contemporary or historical, or a cultural connection that inspires the exploration. These are important as well for both context and learning. STEAM has been a frequent topic on my blog. You can find more posts on it HERE, HERE, HERE, HERE, and HERE. Though many will blog with specific STEAM activities and lessons, my advice is to leave the bells and whistles outside the door and just make it a natural part of what you teach. Vanilla, like STEAM, may the "flavor of the month" but it's been around forever... and just like vanilla, it should be simple. If you need more specific examples of STEAM lessons, explore my blog for free ideas. If you'd like something more concrete, I have a book filled with STEAM specific lessons titled "Art At The Heart" on Amazon, or 30% off at the publisher's website HERE. 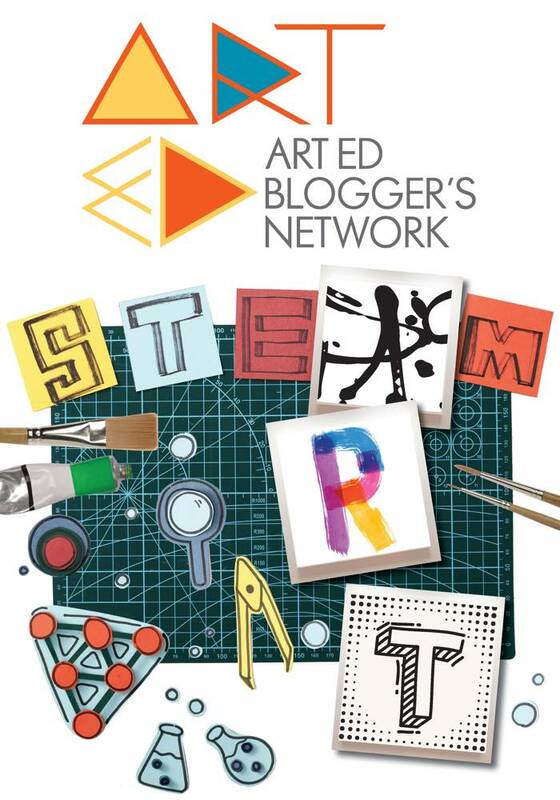 This month, The Art Ed Blogger's Network is writing about STEAM/Art Integration. Join us on the first Tuesday each month for new projects, ideas, and inspiration. Based on my near-30 years of experience and the feedback of a gaggle of art teachers, these are some things one should consider when designing an art room. I have divided this into MUST HAVES, Needs, Wants, and Helpful items. For example, an art room without a sink, is like an omelet without eggs. It can be done, but it's gonna taste wrong. Supply budget too is an important factor. Before looking at a budget number, count how many students you will see in 1 day of teaching, or an average day. (For me, 150 students per day) My "rule of thumb" is that a good program needs about $20 per daily child for the year, but it will be a 2D focused experience with little 3D exposure. A strong 2D/3D program should account for about $40 per daily student per year. So for my 150 student per day I need a minimum budget of $3000 for the year for a strictly drawing/painting class, or $6000 per year for a class that offers the inclusion of sculpture/clay components. I understand though that many get less than this, some get none, and a few get more. See THIS POST if you work with a small budget. How much space does an art room need? If the room is for just 2 dimensional work (Painting/drawing) then 1000 square feet would be adequate for 30 students. More is always better, but this would suffice. If you plan to do 2 dimensional work, more storage space is needed, and more work area, so 1250 feet is required. If clay is to be used, a kiln and additional shelving is necessary, so 1500 square feet is needed. People do work with less, but more space is always desirable. If administration does not think art deserves this kind of space, explain how art can improve overall student performance on State assessments. More info on that HERE. 2 to 4 deep basin sinks with clay traps to catch debris like plaster or clay. 3 is okay, 4 is awesome! Even better, have some space between sinks so more bodies can get to them. Storage is key, and a variety. Locking cabinets that are 36 inches deep are better than 24 in. deep, kitchen-style cabinets, storage under working tables, and sturdy/tall/deep open shelving. A large closet space with a locking door is helpful, but lockable storage is important. Tables: Though individual desks can be fine, many teachers prefer grouped tables, similar to what you might see in a science lab. By working in groups, drop outlets can be put above. Each student needs about 30 to 36 in. wide work space about 24 inches deep. 4 x 4 ft to 5 x 5 square tables is good for groups of 4. Storage for student work: Wire racks, flat files, and drawers. Good ventilation for sprays, paints, and odors. Smartboard or ceiling mounted projection system. If ceilings are tall, cable wire can be strung from wall to wall without touching the ceiling to hang work, mobiles, posters, and visuals. File cabinets, 1 drawer per class. Spray Booth for spray paints, fixative, etc. Display case in the hallway, near the art room or office. Blueprint style flat files, 6 to 12 drawers. Spotlight(s) for shading from life. Lock-able Kiln room, with lots of open and closed shelving for clay, projects, glazes, and tools. For lists of supplies for the different age levels, The Art of Ed blog has a detailed post HERE with lists of supplies that may be a helpful start. Personally I order a lot of my stuff through NASCO. If you contact them ahead of your order, they can give you a code to get 20% off their pricing and free shipping to your school within the USA. I am not sure how international shipping works, if at all. ​Below are some art teahcer's rooms shared on Facebook. Maybe they will give you some good ideas. Let me know if I missed anything & share your thoughts as a comment. ​As the year moves into it's end, I am able to challenge my high school students a bit more. (I have done this will middle school as well) This exploration can be a bit of a mess for the unorganized, but the visual rewards are great. It's not often we get to "mash-up" styles of art in history, but collage, in this mode, hits 3: Cubism, Pop Art, and Op Art. ​All three images by Picasso, Vasarely, and Britto respectively, have a common element of a shattered image. It is through the contours that the subject is revealed. In some cases, less obviously than others. This play of shape, pattern, and line can make for some visually exciting work. For me, as a teacher, I like that the subject need not be the same thing. Each participant can choose their subject to express their own artistic desire. For my class, I made some suggestions: portraits, spirit animals, a theme they feel would appeal as a gift, or an image that showed of their own personality or desires. I have found that working 11 x 17 inches or larger is far easier than working small. Most of these images are that size or 18 x 24 inches. To be fairly successful, you'll need to prepare 5 layers or more to be cut up. Each layer is different. I have a few suggestions we used but I can imagine hundreds of different possibilities. Whatever you create will need to be cut up, so more than 8 layers may be too much. We did 5 or 6. Thinner textures were glued to drawing paper to make them more rigid. Spray glue works wonders for this. Each day we created 2 or three papers, saving techniques we needed to dry out as the last of that day. So we might do foil, and wrapping paper, then finish with a hand painted paper that was allowed to dry overnight. When you have your set of papers, add one more blank drawing paper to the top of your pile. Line them all together in a stack and staple through all of them, about 3 to 4 times on each side. If you have access to a long arm stapler, add 4 to 6 more staples inside the page. These staples will prevent the papers from fanning out as they are being cut. If you've ever cut 10 sheets of paper in a pile, you know the papers "creep" and fan out. This alleviates much of the problem. ​Once the papers are stapled, the top page is the drawing page, and students create a large, fairly simple image. They should know that whatever they draw, they will need to cut out. So tiny details might need to be avoided for more simple ones. Some students chose to draw free-hand, other were allowed to find an image and trace it with my projector. The smaller pieces are, the longer this project will take, and the more likely it is you will need to use Exacto blades to cut. I use "heavy duty snips" from Nasco, they will even cut through staples. When you have an image, you'll need to decide how to divide up the larger portions of the image, particularly the background. I have a VIDEO that explains part of the process. Essentially, you start from one corner, and cut one piece of the drawing. Choose the layer you like for that corner, and cut the next shape out of the drawing and continue to assemble the image like a puzzle. It is important to not jump around or the whole process will become impossible. Start at one corner, making your way slowly, piece by piece through the image. Sometimes additional staples may be needed to keep papers from fanning as you cut. I encourage student to make sure no two colors touch, but sometimes it's unavoidable. At the end, pastels, chalks, charcoals, markers, and paint can be used to alter the image and make separations and enhance lines that may be lost in the process. Because you have 5 or 6 layers, you can make 5 or 6 different final images! I suggest my students do 2 if their image is fairly simple, but advanced students can do more. If the image is very complex, one may just be enough to keep them busy the whole time. The results, as you can see below, are strong. We found that Elmer's Glue, and 3M Permanent Glue Stick seemed to work best to assemble work. Rubber cement too is great if you have a well ventilated room.